It’s playoff time in Chicago, which means hard-working people head to bars every other night for the next month in the hopes of postseason glory and one-night stands. Unfortunately, our teams are currently 0-3 and the binge might last only a week or two. Let’s examine further. 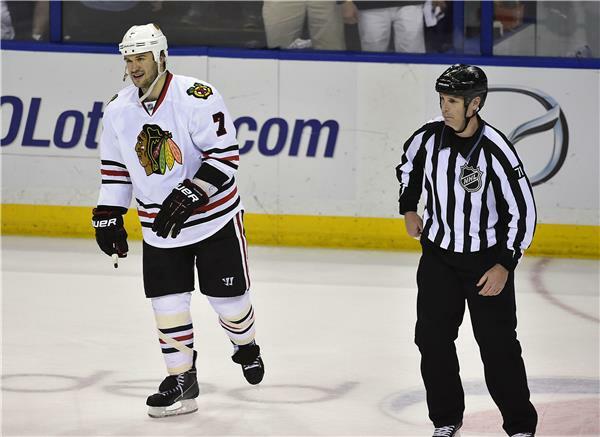 The Blackhawks were well on their way to a victory in Game 2 against the Blues when Brent Seabrook viciously hit David Backes. Seabs got a much-deserved suspension from the NHL, but the hockey meatheads came out in full force to support the defenseman. Brent Seabrook should have a statue resurrected in his honor for that hit yesterday. In other Hawks news, none of us will ever forget the Coach Q crotch grab while arguing with a referee at the end of Game 1. Sure, he got fined, but touching yourself inappropriately while yelling at a grown man in ice skates and a zebra suit is well worth it. Quenneville couldn’t be reached for comment regarding the Seabrook suspension. But we have a guess about his reaction. And it’s really ballsy. Even if Q wins another 10 Stanley Cups, I hope this will be his lasting legacy in Chicago. The Bulls fell short Sunday, but at least Joakim Noah has entertained us with recent tweets about horrendous spring weather and the weirdest celebrity from Minnesota. And, by the way, our baseball teams are still playing, in case you got bored after opening day. I’m not going to lie to you, it’s pretty bleak so far. The Cubs have a new liquor sponsor so people can forget the action on the field, and Sox folk continue to annoyingly complain about nobody caring. Cubs so tough to watch they had to switch to a harder drink sponsor for upper deck patio. From Smirnoff to Jack Daniels. Wait, I thought U.S. Cellular Field was in the suburbs?